At the 26th Annual General Meeting of the club on April 30, reports which outlined the main activities for the past year were presented by the President, Secretary, Treasurer and Programme Action Chairman. The new slate of officers are: President â Gail Davis, President Elect â Miriam Roache, Vice President â Nicola Williams, Secretary â Keisha Fraser, Josie-Anne Small, Programme Action Chairman â Saline Barbour, Club Organisational Development Officer â Lavinia Gunn, Membership Officer â Nelcia Primus and Public Relations Officer/ Website Administrator â Shannon Durrant. The committee members are: RenÃ© Baptiste, Zeitha Hadawy, Kathryn Cyrus and Annelle Thomas. Christine da Silva DeRosa continues as Federation Consultative Councillor, while Gail Davis and Saline Barbour will serve as SI Caribbean Network Representatives for the year. 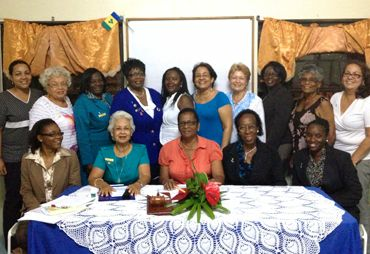 This year the club presented a token of appreciation to their Patron, Lady Gloria Antrobus, for her continual support and guidance in their striving to create a better St Vincent and the Grenadines for women and girls in our community.